If you have the cash to drop over £1k on a GPU and the same again for the CPU, there is a good chance you want the best monitor on the market regardless of the cost. At the moment that gives you two choices, the ASUS 27″ ROG Swift 4K HDR which will set you back £2,179.99 on Scan or the Acer 27″ Predator X27 which is at a bargain price of £1,789.97. It is an obscene amount of money to pay for a monitor, but that’s the price you pay if you want to be an early adopter for ultra-grade products. This monitor ticks all the boxes for gamers it has a 4k resolution of 3,840×2,160 which can also run at 144Hz refresh rate using a 10bit IPS panel that is capable of a brightness of 600 cd/m² with a DisplayHDR 1000 certification and support for Nvidia G-Sync (30-144Hz). The HDR is achieved thanks to the 384 individual dimming zones and is something that will add significantly to the manufacturing cost, partly justifying the final price. Both this and the ASUS are based on a panel by AU Optronics so in theory, there should be little to differentiate them when it comes to performance. Looking at other monitors on the market you have to pick and choose what features you want, if you want 4K there is no high refresh rate, with monitors limited to 60hz. Monitors with proper HDR are few and far between, many of them offering underwhelming performance and only the 43-inch Philips Momentum offering decent HDR at a (semi)affordable price that I am aware of. On top of the insane panel specification, is all the features you might expect for a monitor that costs more than most peoples entire build. To drive the display properly, you will need to use the DisplayPort 1.4, then there is also an additional HDMI 2.0 which will be useful for consoles. There is a USB hub with USB 3.0 Type-B in then three USB 3.0 Type-A out. For audio, there is also a 3.5mm in and 3.5mm out plus dual 4W stereo speakers. The monitor comes pre-assembled, but you can remove it from its stand and use the 100×100 VESA mount. The stand itself is height adjustable with tilt and swivel and is one of the best stands I have used allowing you to find the perfect position for gaming. The overall build quality is superb as you would expect at this price, and the design is the typical aggressive predator styling on the rear. The monitor itself is quite thick and has reasonably chunky bezels this is almost certainly due to the local dimming that is required to achieve the HDR. To adjust the settings there is a little joypad which is quite usable once you get used to it, but it is located on the rear of the monitor on the bottom right, and it took a little getting used to before I could navigate the OSD settings. You shouldn’t need to use them too often though, though for general PC use you probably want to dial down the brightness. I mainly tested this with the Acer Orion 5000 which has a GTX1060 and then later my main PC which has a GTX1070. Neither of which can really test this monitor to its limits, for example, a RTX 2080 Ti will struggle to achieve 144fps at 4K on many AAA games, though the G-Sync would help reduce the issues it faces with this. Even though I didn’t have the GPU power to push this to its limits, it was glorious, and I put in several hours of gaming with Far Cry 5, as well as Fortnite, Mass Effect: Andromeda and Assassin’s Creed Origins. I would say the scenery in Far Cry 5 can look a little glossy at times, but this is not an issue with the monitor just the exaggerated HDR effects of the game. Gameplay was always buttery smooth thanks to the G-Sync though with the GTX1060 I ran the game at just above the recommended settings. During my usage, I experience no light bleed, and there were no dead pixels that I could tell. This is a PR sample though so I doubt they would send a faulty screen. Ghosting was not noticeable and the response time was superb as far as I am concerned. I should note that I am not a huge FPS gamer, and rarely play online so a low response time and high refresh rate can be a little wasted on me. The colours also look superb, I don’t have a colourimeter to test the accuracy, but blacks were solid or washed out and the overall colour appeared to be excellent. The 10bit panel is what helps this achieve a much better than average colour accuracy. This isn’t really designed for day to day office use, and I find 4K at 27-inch is less than optimal, it is much better at 32-inches. While you wouldn’t buy this for office use, I did use it for a few hours, and once you tone down the brightness, then it is a pleasure to work on. My final opinion on most reviews usually is heavily influenced by the price, and with this it is a bit hard to give a proper opinion. On the one hand spending £1800 on a monitor is absolutely crazy, and it is no way value for money, but on the other, it is over £300 cheaper than the only other monitor on the market that can compete with this. That is an 18% difference which is quite a large margin and based on that it is an absolute bargain. During my use, I found the monitor to be flawless and it is easily the best gaming monitor I have tested, even if I couldn’t really push it to its limits. 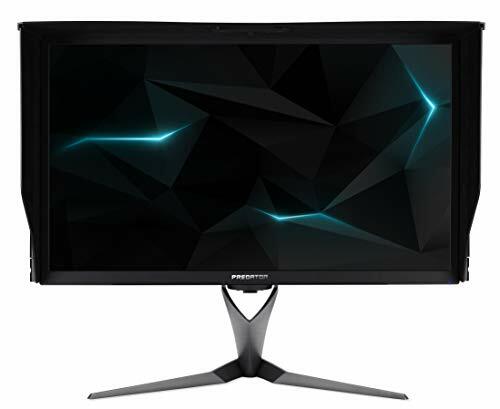 So, while I am not going to suggest everyone goes out and buys this monitor, if you have already spent several thousand on an RTX 2080ti based PC and want the absolute best monitor to go with it, then this is the best option in my opinion. Painfully expensive but this is one of the best monitors on the market with features that very few other monitors come close to and requires a PC with a specification to match. PreviousSamsung Galaxy M30 specification revealed. How does it compare to the M20?